Decide today with iElect 2012! Ever wondered which political party to choose in the upcoming election? iElect lets you find this answer through a simple questionnaire that takes only a few minutes, right on your iPhone, iPod Touch, or iPad. 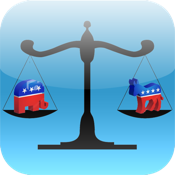 iElect 2012 is a handy app that will help you decide which of the two parties fits you best. Through a wide variety of specifically designed political questions, the application will provide you with a concise answer, along with a percentage of how many questions you answered corresponding with that party’s platform. iElect 2012 is the ultimate app that will guide you to the best decision on election day - November 6th, 2012. Future versions will contain additional questions as well as support for more political parties.